• About different cultures around the world. • How to work together and perform collectively. We have been practising using coins to add 2 items from the shopping basket this week and we are getting much better at using money. We have also been revising the names of 3D shapes and matching them to items found in the food cupboard at home. We found out that tins and cans are cylinders and most boxes are cuboids. PC Steve came to visit us this week and told us all about the emergency services. We knew lots about the police,fire and ambulance services and we also learnt about the work of the coastguard and mountain rescue. We have been thinking about our mums this week and all the things they do for us. We wrote about our special mums and made lovely cards to give them on Mother's day. Don't forget to spoil your mum on Sunday and be extra good!! On Friday we made our faces funny to raise money for Comic Relief. Well done to everyone who helped to raise lots of money. We had a lovely day celebrating St David's Day on Monday. We dressed up in our Welsh costumes, Welsh rugby tops and we even had a dragon! We sang beautifully in the concert and our teachers were very proud of us! This week we have been learning about all things Welsh as we prepare to celebrate St David's Day on Monday. We have painted dragons as part of our Eisteddfod competition and we have been learning Welsh songs for our performance. Many of us were very busy during half term making castles, sock puppet dragons and love spoons. Mrs James and Mr Lane were very impressed by the standard of the entries and are glad that we are not judging them! Winners to be announced on Monday! 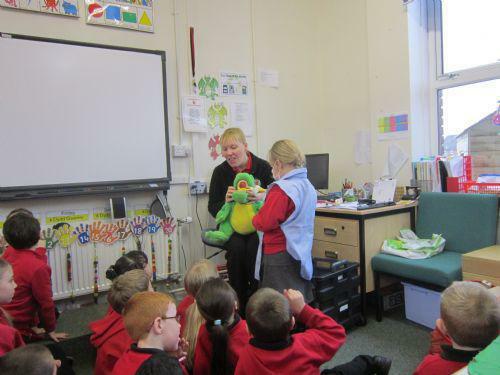 We had a special visit from Dewi the dragon who came to remind us how to brush our teeth properly. We hope everyone is remembering to do this at home too! We had a wonderful time at the Carnival exhibition this week! Look at the photos of us in fantastic costumes in the folder below 'Carnival Photos'. We have had lots of fun this week learning about the Chinese New Year. We acted out the story of the race of the animals , the rat was the winner and so the first year was named after him. The children worked hard retelling the story in their books - ask your child what happened to the cat! We had a go at using chopsticks to eat rice. Some of us were very good at it but others found it tricky! We all persevered and where there is a will there is a way! We are all very excited about our visit to see the Carnival exhibition in Cardiff Story museum on Monday - look out for lots of photos! We have been learning about pattern and colour in maths this week. We have been repeating patterns using three colours and making our own patterns threading beads. We have started learning about the Chinese New Year and the way in which it is celebrated. We learned that red is a lucky colour and we made some lanterns with Mrs Romanelli. It is the year of the sheep this year and we found out which animal year we were born in. Some of us are rats and the others were born in the year of the ox. We wrote about our chinese personality which follows the traits of the animal. Mr Lane is a horse and Mrs James is a dragon!! We are making our role play area into a Chinese restaurant and we are looking forward to cooking and eating in there next week! Last week we leant lots about Brazil and this week we have been learning about Wales. We listened to a traditional Welsh tale about Gelert which made some of us feel very sad- ask your child about the ending of the story! In our maths sessions we have been using a variety of coins to make different amounts of money to buy things at the toy shop. The children could practise this at home too with some loose change! Year 1 were very proud to win the attendance cup for the best attendance for last week.This is the first time we have won it and we were rewarded with an extra playtime! Keep it up Year 1! We hope we can win it again! Year one have had an exciting week learning about 'Carnival' in Rio de Janeiro! The children have been telling Mr Lane & Mrs James all about Brazil. We are delighted to hear how much the children know about the wider world. The children have told us all about the football World Cup that took place in the summer of 2014. 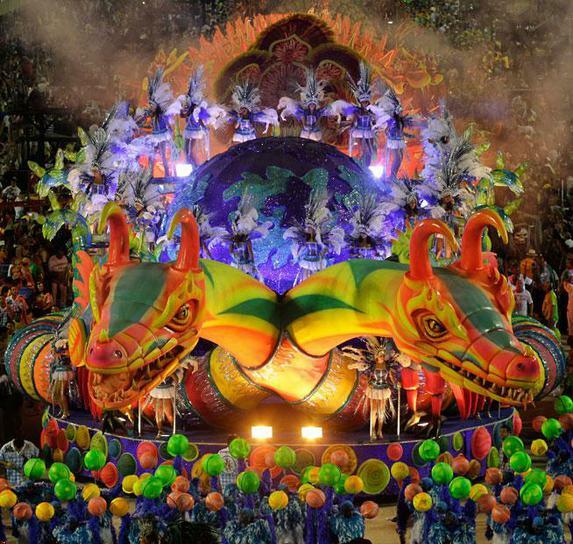 They have also re-told everything they have learnt about the beautiful costumes, colours and sounds of the 'Carnival'. Some children have even researched what they have found out on the computer! We look forward to a week of creativity where the children will be able to design and make their own Carnival headdresses. Welcome back! We hope you have had a lovely christmas and we would like to wish you a very happy new year. The children are very excited about our new topic 'Carnival' and we introduced it by watching the film Rio and talked about the Rio carnival in Brazil. Next week we will be finding out lots more about the carnival and the country.